African Pearl Safaris: Buganda Kingdom’s 1 mile road of Loyalty. Buganda Kingdom’s 1 mile road of Loyalty. The historical lane commonly known as Kabakanjagala Road is a magnificent stretch from the official palace of Buganda’s king (the Kabaka) to the Kingdom’s administrative centre at Bulange, Mengo. It is located in mengo, Rubaga division, about two kilometers from the city centre. It is more striking when you are descending from Lubiri Palace viewing Mengo hill with the towering Masengere and Bulange parliament buildings framing the horizon. 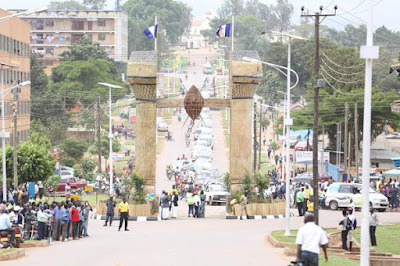 Down the road between Buganda Kingdom’s Lubiri palace and the parliament, is a roundabout called Lukoma Nantawetwa which was recently redesigned with a monument of a long drum (engalabi) hoisting a shield and two spears. These represent the historical symbol for Buganda’s mighty protection against adversaries. This unique monument stands 11meters tall. This roundabout is unique in that it has a gateway for the Kabaka to go through instead of driving around it. The gates are kept locked and inly opened when the Kanaka’s motorcade is to go through them. The road was used by Ssekabaka Mwanga II, who reigned in the 1880s. People used to line up along a path on the same route to welcome the King as he passed. The same route was used by successive kings, including Kabaka Daudi Chwa and Sir Frederick Mutesa II. This road’s name came from the fact that the king’s subjects always stated, while using this road. That the king wanted to see them. For decades, the stretch was lined by over 70 mature candle nut trees, commonly known as Kabakanjagala. The trees are said to have been planted along the stretch by Zakariya Kisingiri who was Kabaka Chwa’s regent and treasurer. Kisingiri’s residence was located along that same road and the house still stands today. He is also said to have brought the seedsto Uganda from the Seychelles when he visited the exiled Kabaka Mwanga on the Indian Ocean island. Originally, there were 52 trees and each represented clan. But the reigning Kabaka Ronald Mutebi added another four to make 56. The century-old trees, were however felled by Kampala Capital City Authority in 2013 for the expansion and beautification of the road. Solar-powered street lights have been added. After the road was refurbished, new trees of the same tree species were planted in a campaign led by the Kabaka.